Chula Vista is the second largest city in San Diego County and in the Spanish language the words Chula Vista translate to Beautiful View. With the San Diego Bay on the western border and Otay Mountain to the eastern border the views are wonderful in either direction. In recent years Chula Vista has had a real estate explosion. Many new home communities were built in the eastern part of Chula Vista. New home builders like McMillin, Pardee, Davidson, K Hovnanian, Pulte, Lennar, Brookfield, KB Home, D.R. Horton, Standard Pacific Homes, Cornerstone, Davidson, Baldwin, Shea Homes to name some, built wonderful homes to buy and live in. Contact The Lewis Team to find out more about Chula Vista Real Estate. Chula Vista has many different communities, parks, shopping areas and more to enjoy. The weather is wonderful year round and is similar to the weather in the Mediterranean. 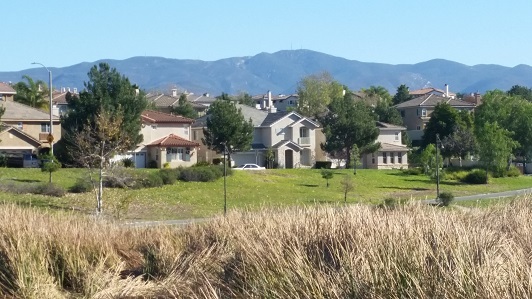 There are beautiful mountain views in many areas of Chula Vista and in eastern Chula Vista communities like EastLake, Otay Ranch, Rolling Hills Ranch and Bella Lago the views of the mountains are spectacular. Otay Mountain is from the Kumeyaay Indian word meaning “otie” which means “brushy”. I’ve hiked up there a few times and the landscape is very brush like with small plants and tumble weeds. 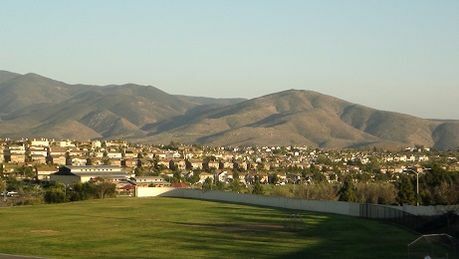 Otay Mountain has two lakes at its base, one is the Lower Otay Lake and the other is the much smaller Upper Otay Lake. The lower lake is can be fished on some days of the week although there is no swimming or waterskiing in either of the two Otay Lakes. New home communities and real estate tracts have crept very close to the Otay Lakes in neighborhoods like EastLake Vistas, EastLake Woods and Rolling Hills Ranch. Otay Mountain is the largest mountain in the San Ysidro Mountain chain and has an elevation of 3,566 ft. San Miguel Mountain is just north of Otay Mountain. Chula Vista is located just about 8 miles from downtown San Diego but add another 5 miles or so on to your odometer if you’re going to travel into the newer East Chula Vista to communities like EastLake, Otay Ranch, Rolling Hills Ranch, Bella Lago and Windingwalk. Chula Vista is also located about 7 miles from the boarder of Mexico. It’s has a nice mix of older and newer communities to live in. Most of West Chula Vista is the older part and then newer communities and homes are in the Eastern part. There are new home communities in Chula Vista being built even today and should continue for quite some time. One of the more recognized sites in East Chula Vista out by EastLake and the Lower Otay Lake is the United States Olympic Training Center. The history of Chula Vista starts as early as 3,000 B.C. with Native Americans settling the area. The Kumeyaay tribe moved into the area much later and was living in the area when the Spaniards arrived in 1542. Juan Rodriguez Cabrillo the commander of 3 Spanish ships sailed into the San Diego Harbor and claimed the land for Spain. Chula Vista became part of the Rancho Del Rey meaning “The Kings Ranch” land grant in 1795 and the land was renamed Rancho de la Nacion years later. 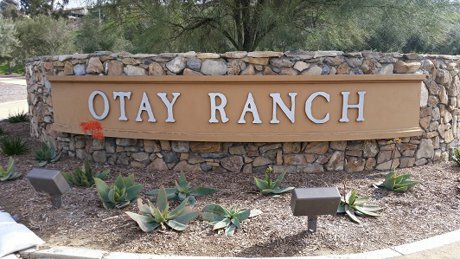 This is where the community of Rancho Del Rey in Chula Vista gets its name. After the Mexican-American War, California became part of the United States. The land grants that were already in place were allowed to continue as private property by the United States Government. The first house that was built by the developer, San Diego Land and Town Company, was in 1887. They had purchased the land of the Rancho de la Nacion and began a 5,000 acre development. The Sweetwater Dam, built in 1888, helped Chula Vista become a farming community which at one time was the largest lemon growing area in the world. There are 3 United States Olympic Training Center campuses and Chula Vista has one of them. The other 2 are on Colorado and New York. The Chula Vista Facility which opened in June of 1995 is a year round, warm weather facility. It was a gift from the San Diego National Sports Training Foundation to the U.S. Olympic Committee. The Olympic Training Facility sits on 155 acre complex and has training for the following sports; cycling, archery, BMX, canoe and kayak, field hockey, rowing, rugby, beach volleyball, soccer, tennis, track and field, triathlon, and cross-training abilities for various winter sports. You can visit the site and take a tour – Chula Vista Olympic Training Center. Chula Vista Beaches are non-existent but don’t worry you can easily get to and enjoy the beaches in Imperial Beach, Silver Strand and Coronado. Chula Vista does have a very nice Marina if you are interested in boating and keeping a boat of your own in the water. The Chula Vista Marina is located in the older part of the city at the very end of J Street. There are a couple of restaurants at the Marina as well and is a great place to have a stroll or spend a few hours. There are also some very nice views of Downtown San Diego and the sunset from this location. Want to know the value of your home or condo? Are you considering buying or selling a home or condo in Chula Vista? If so we would love to help. Contact us today to get started.